Americans resoundingly reject ObamaCare. What, then, accounts for the Democrats' determination? Democrats believe health care is a right. Start with that premise and everything else makes complete sense. Rights -- whether the right to vote or to freely assemble or to avoid self-incrimination -- exist independent of popular feeling, poll numbers or even, in the case of health care, the Constitution. Democrats don't care how much ObamaCare costs. When President Barack Obama addressed Republicans, Rep. Paul Ryan, R-Wis., carefully outlined the costs of this "reform." He explained why costs figure to go up, not down. To someone truly interested in a cost-benefit analysis, these points warrant a rebuttal. But as MSNBC host Ed Schultz said, when it comes to health care reform and money, "I don't care how much it costs." An owner of an NFL team fired his coach despite the team's winning record. He explained, "I gave him an unlimited expense account -- and he exceeded it." To Democrats, "economic justice" knows no price tag. Democrats consider election losses a small price to pay for health care "reform." Predictions range from moderate fall election losses to a bloodbath resulting in a Republican takeover of the House and possibly even the Senate. To this Democrats say, "So what?" Once health care reform becomes law, that's that. Only a Republican charge with a filibuster-proof Republican supermajority in the Senate could undo it. Besides, President Bill Clinton got re-elected when the Republicans took over the House. And although he gives Republicans no credit, Clinton thereafter governed closer to the center, turned House Speaker Newt Gingrich into a convenient whipping boy, cruised to re-election and left office with a budget surplus. Obama, Democrats figure, could do a lot worse. Democrats blame Americans' confusion about ObamaCare's virtues on Republican "lies." Democrats claim that ObamaCare would decrease costs while retaining the same or better health care quality. Republicans say the opposite. 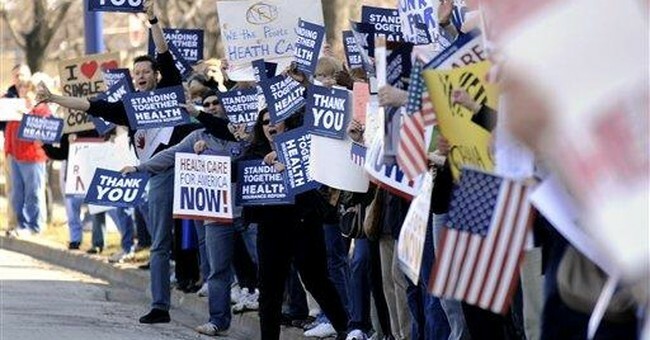 Massachusetts' RomneyCare, which is similar to ObamaCare, has failed to reduce costs. The three big entitlement programs -- Social Security, Medicare and Medicaid -- are all in deep financial trouble. At inception, the programs' cost estimates were wildly underestimated. None of this provides cautionary lessons. Republicans lie. Democrats believe that they truly care about people and that Republicans don't. Obama tells of an uninsured self-employed Ohio woman receiving cancer treatment at the Cleveland Clinic. The woman, he says, faces the prospect of losing her home because of the hospital bills. Never mind the Cleveland Clinic offers millions of dollars of non-reimbursed care annually. Never mind that the world-renowned medical facility said it has no intention of going after her home. And never mind that the woman, according to the hospital, is likely eligible for several charitable programs. Democrats say, "If you like things as they are, don't worry." Eighty-five percent of Americans have health insurance, and 89 percent of them are satisfied with it. This poses a problem for "reform." MSNBC's Chris Matthews once wrote that because HillaryCare failed to calm the satisfied, it collapsed. "People," said Matthews, "saw their hard-won benefits and options being siphoned off to fund the health needs of all comers. Instead of securing the health care of the 'working family,' Hillary Clinton was offering 'universal coverage' for those who didn't work, financed by those who did. It was an offer people were eager and quick to refuse." Democrats say, "If you like your plan and your doctor, you can keep them." But won't some employers drop their employee plans, pay the fines and slough the costs onto the taxpayers? And won't some doctors, as polls suggest, restrict their practices or quit altogether? No, because, well, they just won't. Democrats bask in an Obama-loving liberal traditional media. The media cheerlead for health care "reform" and desperately want to give the President a "victory" -- while accepting preposterous claims at face value. ObamaCare promises to extend health insurance to 30 million people; promises financial assistance to those unable to afford insurance; requires all employers to offer health insurance or pay fines; requires every American to obtain insurance or pay a fine; and promises to attack "unwarranted" insurance premium increases while requiring insurers to enroll those with pre-existing illness without dropping anyone's coverage. And it would lawfully achieve all of this without increasing the deficit! Democrats believe that if people are too dumb right now to see the benefits of ObamaCare, someday they will. If not, opponents will be powerless to do anything. Some people refuse to see what's best. That's why God created Democrats. Democrats ultimately want a Canadian-style single-payer system. ObamaCare will result in cost overruns, caregivers driven out of business, declining quality, rationing, reduced innovation and bureaucrats determining who gets what, how and when. What then? When the complaints grow loud enough, Democrats will be ready -- with a plan to "reform" the "reform."